Deaf Dogs and Benevolent Gnomes: North Dakota Polar Bear? Even though it's pretty far north, there aren't any actual polar bears in North Dakota. But, it's spring melting time right now, which is great even if it is weeks earlier than normal. Shadowfax though is still holding on to winter like a polar bear clinging to a melting iceberg. The ring of snow was part of a sweet snow volcano that John created as part of his winter "backyard terrain park" for the dogs. The giant mound of snow made a great ramp for rolling the ball up into the air for Shadowfax to chase, a fun king-of-the-hill mound, and the perfect obstacle to chase around. 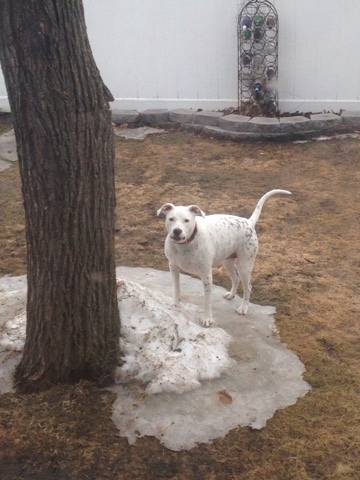 We're not sure if her preference for the small patch of snow and ice is a good thing because she's staying out of the mud or if it's ridiculous that she chooses to chance an icy slip.